As much as I love content marketing, when I look around at the sheer number of people using it, I’m reminded of another frenzy that didn’t end well — the dot-com bubble. Remember when everyone and their cat was launching a company or selling a domain name for tens of thousands of dollars? Until it came crashing down. There’s a lot of buzz about whether the same thing will happen to content since we’ve gone from only the early adopters embracing it to every HVAC business and nail salon jumping on the content bandwagon. And every second, 17 new blog posts are published. Isn’t there only so much content we can take? What happens when we reach the point of saturation? Can we reach the point of saturation? The fundamental difference between the content bubble and the dot-com bubble is that we’re smarter. Content already has evolved. Ten years ago, we were slapping articles up on article directories, now we’re focusing on highly targeted content that informs and assists our readers. We’ve moved from people using encyclopedias to get information (OK, that was more than 10 years ago) to relying on their smartphones to give them information anytime, anywhere. That’s thanks to content. While I don’t think the bubble will burst and content will dry up, I do think that it will continue to adapt to our ever-changing needs, as well as to new technology that modifies how we consume and interact with data (think Amazon’s Echo). Rather than preparing for the content apocalypse, I encourage you to simply be open to how this inundation of content — both useful and utter drivel — will change in the near future, and be ready to go with the flow when it does. Here are some of my predictions about what the future of content will look like. Even now, the tired “10 Reasons to Do [Something]” posts are turning to dust. We can only read so much of the same article over and over. This is a good thing. Lately, I’ve really worked to step up my content game and come up with more interesting angles and topics that haven’t been rehashed a million times. The secret to success in the future will be — you might be surprised — to read more. You’ve got to have a handle on the content that’s out there to know how you can make a topic better and unique. Set up your feed readers, folks. You’ll likely spend as much time reading as you will writing in an effort to remain relevant and useful with your content. How do you make your content more strategic and valued by your audience? You have a content strategy. And yet, only 32% of B2B marketers have a documented content marketing strategy. If you start by knowing what you want to achieve through your content, as well as who you’re trying to reach with it, you can create better content that lines up with your marketing message. Search engines — the bane of a marketer’s existence. As soon as we adapt to one algorithm, Google (and the others) move in a different direction. Right now the keyword is relevance. Google assures us that if our content is relevant, it will rank well. But what happens when everybody’s content is relevant? We’re back to the beginning in trying to outrank the competition. Expect search engines to add other factors to the equation for how they determine a site’s worth. Google currently has 200 factors it ranks for search engine placement. There will be more. Search engines may put more focus on how long a person spends on your site, how many pages they click, or how many shares a post gets and on which social sites. We can’t even imagine some of the other factors right now. It’s hard to prepare for the unknown when it comes to search engine ranking, so my best advice is just: Be ready. Pay attention to announcements about new algorithms and do your best, without stressing, to keep up. First, the 400- to 600-word posts were the sweet spot. Then we moved onto longer form content of over 1,000 words. Some posts today are 3,000 words. But there’s a unique challenge as we increase word count for content because people have an ever-shrinking attention span of — what’s that shiny thing over there? — eight seconds. Your content has to be stellar if you want them to spend minutes reading a several-thousand-word post. This goes back to stepping up your game and not writing content just to have content out there. If you don’t have enough to say in a 3,000-word post, don’t write one. Posts like the kind Neil Patel writes are extremely useful and provide hands-on tips, which make people stick around to read them. Insert screen shots to illustrate points. Focus on how to, not why, because people want help doing things. Break up the content with subheads, images, and bullet points to give the eye a break. But don’t be surprised if the ideal content length changes again. To adapt, I like to read case studies about why a particular length has value before I incorporate it into my own marketing. You can always find tips for leveraging content at that length and incorporating the strategies into your own content. Remember when Groupon had dozens of competitors, all offering highly discounted deals? And then the small players melted away and Groupon became pretty much a monopoly? I suspect something similar will happen with content. Right now, businesses have their own blogs, which they struggle to send traffic to. If you’re in the business of selling office supplies, your blog probably isn’t high on your priority list. On the other hand, publishing content on established blogs can send traffic your way even faster. My prediction is that we might all wind up consolidating content, much the way the daily coupon industry did. With a few key players that can filter content for quality and guarantee traffic, some businesses might even abandon their blogs altogether. Social media is another enticement to move away from the business blog. While Tumblr appeared to be a contender to the average blog for a while, we haven’t seen it take over. LinkedIn, on the other hand, is rapidly helping B2B marketers reach a giant audience quickly through its publishing tool — more than 1 million users are publishing content on that platform. Further, Facebook’s Instant Articles is another tool that could turn the heads of content creators away from their own blogs to where millions of people are already spending time. 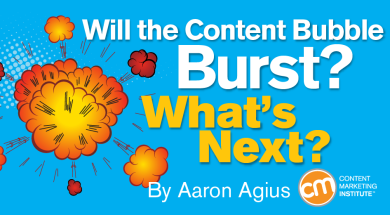 I think if a bubble is to occur, it’s going to be with written content. After all, we can only read so much. But there are other ways to impart information, including video, which is having its heyday, thanks especially to livestreaming. Facebook Live is evidence of this. Live videos rank higher in news feeds, giving you more opportunity for exposure. Interactive content is another area I expect to see more activity in soon. By engaging your audience through games, calculators, quizzes, etc., you have a better quality experience with them, which can lead to long-term engagement. Infographics and user-generated content are two other examples of how you can take your content in a direction other than a written blog post. Vary what you publish and measure results stringently. Add images and videos wherever possible, as you can see on sites like NeilPatel.com, Buffer Blog, WP Millionaire, and others. This will tell you how your audience likes to consume your content, and you can vary your content creation plan accordingly. Expect the line to blur between marketing content and sponsored content. It already is. But with estimates that say advertisers will be spending $21 billion on native ads and sponsored content by 2018, the world of advertising is going to change. I think we’re going to see a bit of upheaval in the native advertising space for a while. Facebook’s announcement of its new policy for sponsored content shook up the industry a bit. Now, sponsored posts will be attributed as such so users know that they’re different than other posts. The question is: Will they care? I think if advertisers can do a good job with their branded content — if they focus fully on customer delight rather than making it a PR puff piece for a brand — they’ll successfully integrate with content best practices. If they can’t, we’ll ignore them the same way we’ve been ignoring television commercials for years. This post isn’t to say that there’s no upheaval on the horizon when it comes to content, but rather to say that while content isn’t going anywhere any time soon, it will change. Typically, people are resistant to change, and digging your feet in the sand may cost you if you’re unwilling to adapt. Stay open and you’ll manage to be one of the few who truly maximize the potential of great content marketing. What do you foresee for content in the near future? Share your insights with me in the comments. Want to ensure that you’re up on the latest evolutions in content marketing? Subscribe to the CMI daily newsletter.